Firstly Happy Valentines Day! Following on from my previous lip post I wanted to blog about my new lip routine. Winter really affects my poor skin and my lips, I use lip balm several times through the day, if I don't my lips tend to dry up and crack and then bleed. When I don't look after them I can't wear lipstick because there's nothing worse than dry cracked lips with layers of lipstick over the top. It doesn't cover them up but instead I think it makes them look worse. Thankfully my lips have been in really good condition this winter and I've been able to enjoy wearing lipstick. Even with winter nearly over I still think it's a great time to treat and care for your lips, especially seeings bold lips are bang on trend this Spring/Summer. If you have dry lips you may have heard of the little toothbrush trick, using a clean toothbrush gently buff them. This helps exfoliate them and get rid of any flakiness but also helps the lip balm to absorb better and work quicker. However I have been testing a lip scrub, I've heard of lip scrubs but never used one until now. 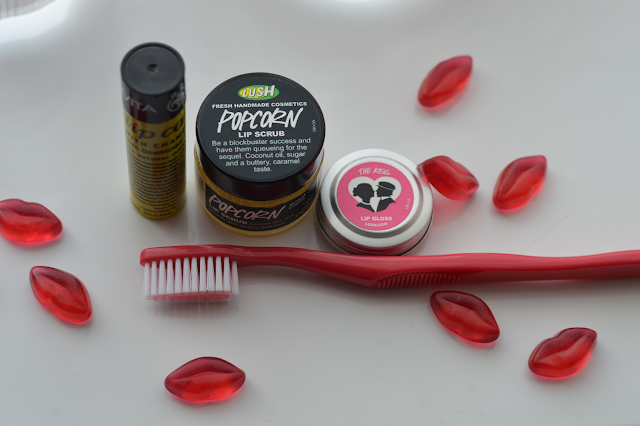 Lush Popcorn Lip Scrub*, warning this smells good enough to eat! I've used this daily since I've had it and whilst I thought my lips were in a good condition they're even better now. Just by using a small amount and buffing the scrub gently over my lips has made such a difference, they feel super soft and smooth. You notice a difference after the very first time using it, when I applied my lip balm I then noticed how smooth they actually were. Coconut and Jojoba Oils help moisturise the lips and the mix of sea salt and polenta work to buff the lips. The texture and formulation is gentle and not harsh like it may sound. I've been following with my favourite balm at the moment which is by the Greek brand Apivita, exclusive to M&S. They have a great range of lip balms, this is their Chamomile* one. It is packed full of hydrating ingredients and to top it off contains a SPF15. One to have in your bag at all times. Lush have released their Valentines Day collection and one of them is The Kiss Lip Gloss* disguised as a lip balm. A luscious kissable strawberry milk gloss which is very subtle but looks gorgeous on the lips. I love the sweet quirky packaging. A first from Lush to make a Vegan Lip Gloss which is free from preservatives. 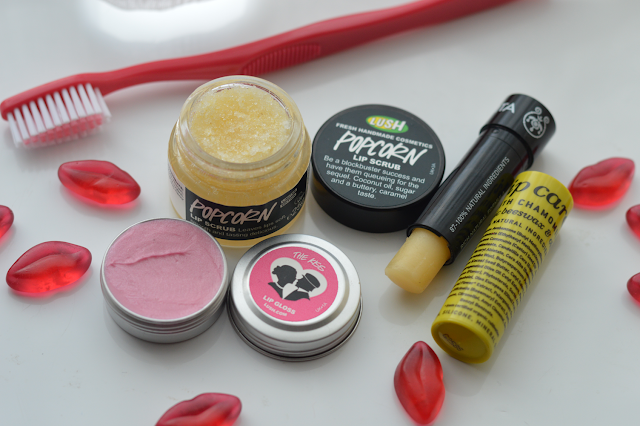 Really want to try that lush lip scrub, heard so many great things about it! Enter my giveaway to win £70 to spend on shoes!